Our sightseeing on Day 9 ended with a trip through the Accademia--home of Michelangelo's iconic David. Of course I knew what this sculpture looked like, and yet seeing it in person is so much more impressive than any photo. I don't think I had realized just how huge it was: 17 feet tall! 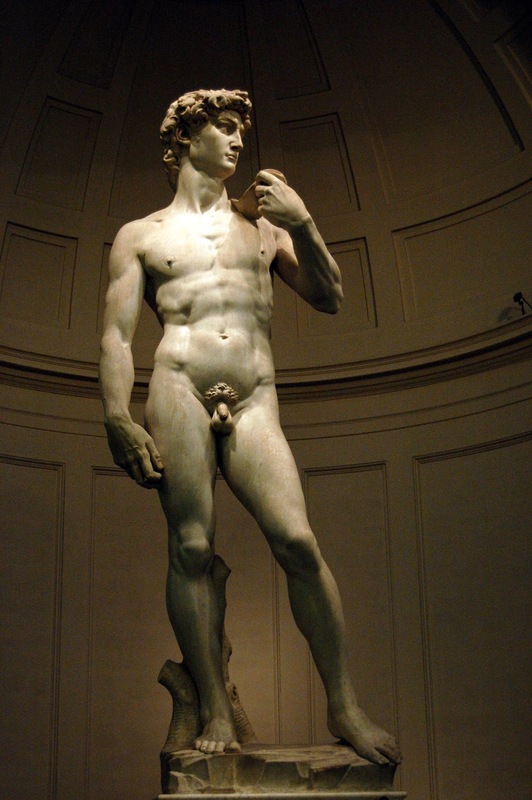 The great thing about the Accademia is that David is displayed on a high pedestal, meaning (unlike the famous paintings at the Uffizi) it's easier to admire it even with throngs of people crowding around it. 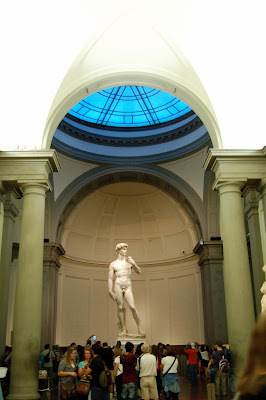 As I understand it, this museum was essentially built specifically to house this one sculpture. What an incredible gift Michelangelo had. To think this was carved from a single block of marble that had previously been worked on by two other sculptors already...astounding. 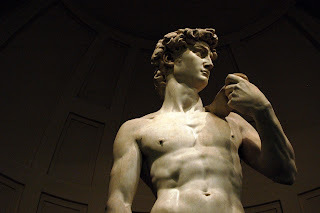 We continued our sculpture-tour on the morning of Day 10 with a visit to Museo Nazionale del Bargello. The Bargello is the world's most important museum of Renaissance sculpture. A visit begins in the courtyard, which is lined with various pieces. One of the displays that most interested me was this side-by-side comparison of bronze panels by Ghiberti and Brunelleschi. "The competition for the second door of the [Duomo's] Baptistery...in 1401, is commonly reputed to have been the event that inaugurated the Renaissance. Among those taking part were Lorenzo Ghiberti and Filippo Brunelleschi, both declared equal winners even though it appears the latter decided not to take part in the assignment. The models to be submitted...had to portray the Sacrifice of Isaac... Ghiberti's composition [on the left] stands out first and foremost for the balance between the figures and the space divided diagonally by the rock, and the refined decorations on the altar which testify to this artist's exceptional talent as a goldsmith. ...Brunelleschi's relief instead shows a single space in which the figures, distributed on parallel planes, hardly fit into the frame. With the abrupt rhythm of the gestures the artist accentuates the dramatic sense of the action about to take place, demonstrating a more modern interpretation." 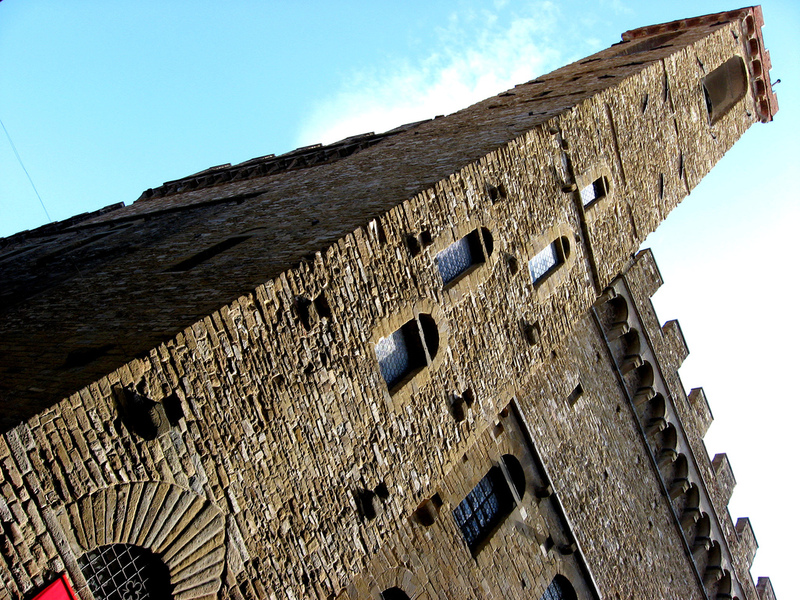 The Bargello was the last of our museums, and by this point I had definitely reached my absolute limit. It was an immense privilege to see so many great works of art in person, and yet my limited brain could only absorb and appreciate so much!